Filed under apple on March 09, 2013. I’m enamored with a keyboard. Not because this keyboard has the best feel (this honor belongs to an old IBM keyboard with mechanical keys that made a very nice “clickity-clacky” as I typed). Not because this keyboard is wireless (those are pretty common nowadays). Not even because it is the most attractive keyboard (that honor goes to an Apple keyboard). I am enamored because this keyboard allows me to pair three separate bluetooth devices and quickly switch between them with a simple button press and nary a battery purchase. My new goto keyboard is the Logitech K760. Let’s get the price for this tech out of the way first. The retail for the K760 is $80. But you can snag one at Amazon for about $58. When you compare the price against the official Apple Bluetooth Keyboard at $69 and the extra capabilities the K760 provides, this is a no brainer Mac keyboard purchase. The K760 may not share the industrial design of its Apple counterpart, but it doesn’t look half bad. You can compare the two in the image below. 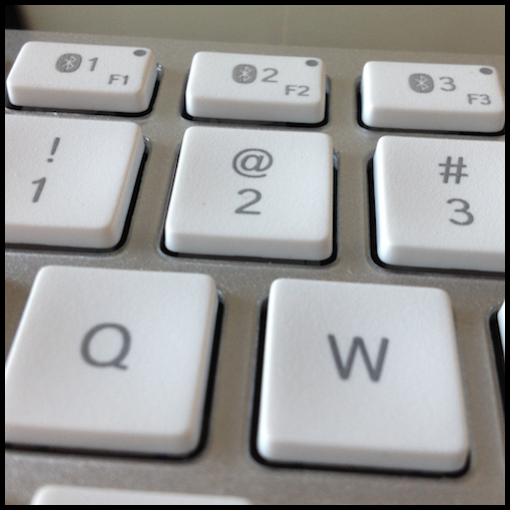 The look and feel are the obvious comparisons between the two keyboards. The Logitech keys are a bit more smooshy (is that a word?) than those on the Apple Keyboard and the travel a bit further. 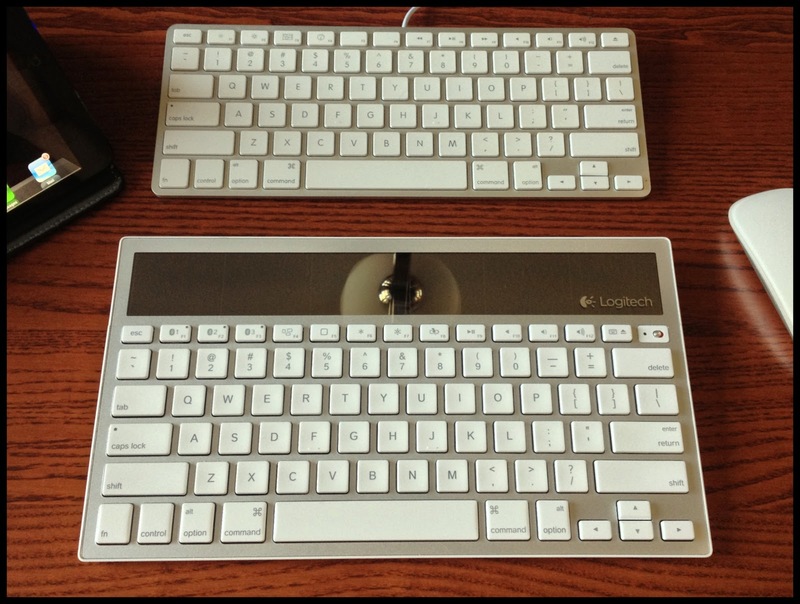 The Logitech takes a bit more desk space than the Apple keyboard. For my use though, the physical characteristics of both are similar enough that they are not important when deciding between the two. The hardware design that stands out when you look at the K760 is the large solar panel at the top of the keyboard. It is this strip that powers the bluetooth electronics within the device. There is a battery inside the keyboard, but it is non-user accessible. The solar panel is continually charging the internal battery. You will never need to purchase a battery for this keyboard! Change the batteries about 10 times and you pay for the keyboard. Logitech claims that even without light, the keyboard will operate for 3-months. I can’t think of a situation where I would be in the dark for three months (well, I can, but that’s for another blog post). My keyboard remains in a low-light location most of the time and it works every time I press it into service. There is an on/off switch that you use when traveling to ensure that a button is not pressed continually and drains the current charge. If you are the eco-friendly kind of geek, you will immediately appreciate this keyboard’s solar feature. If you are less than eco-friendly, you will still appreciate that you will not have to purchase batteries. The final feature that puts this keyboard ahead of the pack is bluetooth pairing. Sure, both the Apple and the Logitech keyboard pair with a computer – they would be useless if they didn’t – but the Logitech will pair with not one, not two, but three devices. Think about this for a minute. You can pair it with your Mac, iPad and iPhone – all at the same time. One keyboard to rule them all. To switch between devices, you simply hit one of the bluetooth keys at the top of the keyboard (as shown in the image at the top of this post). This is incredibly useful as you can see in my setup to the below. I can work on the Mac, tap a bluetooth key, immediately input text on my iPad to respond to some notification, tap a bluetooth key again, and I’m back to text input on my Mac. The iPad becomes an extremely useful secondary screen. Since the keyboard is always paired with my iPad mini, I like to throw the keyboard in my shoulder bag for use at the local coffee shop or to capture notes during meetings. I can’t think of a more useful wireless keyboard. 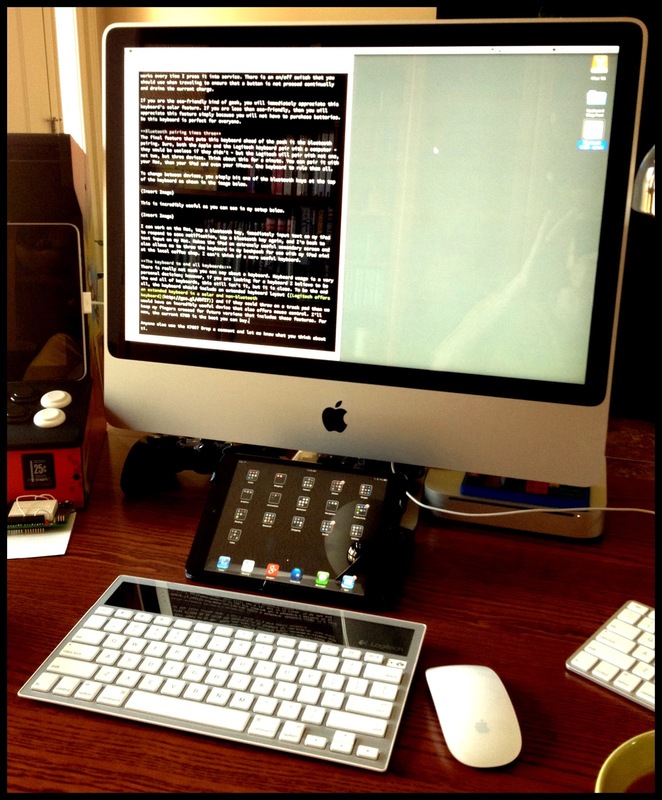 I’ve even found that I use my iPad mini more for “real work.” This blog post began on the iPad mini with the Logitech keyboard. There are two things I would like to see in a future iteration. The first is an an extended keyboard layout (Logitech offers an extended keyboard in a solar and non-bluetooth keyboard). Secondly it would very convenient to have a solar track pad or a companion solar mouse. I’ll keep my fingers crossed for future versions/products that include these features. No keyboard works for everyone. Keyboard usage and feel are very personal decisions; however, if you are looking for a keyboard I believe to be more useful and productive than most, the Logitech K760 may be it. Anyone else use the K760? Drop a comment and share your experiences and/or wish list.